Whether you’re looking for a place to cheer on your favorite sports teams, treat your friends & family to a fun lunch out, or just grab a drink with your colleagues after work, Kickback Jack’s is the place to be. Our sports bar in Mooresville provides a welcoming atmosphere so you can sit back, relax, & enjoy a nice cold drink in a casual environment. Come check out our restaurant, opening mid-June, and meet your new favorite spot for beer, food, and sports. What more do you need? Here at Kickback Jacks, we’re not your average sports bar in Mooresville. We have something for everyone when it comes to food and drinks. Whether you’re loyal to your favorite domestic or you’re a local brew enthusiast, we’ve got you covered. 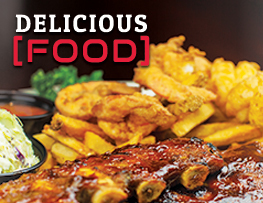 Our food is fresh and made-from-scratch to provide you with a sports bar dining experience unlike any other. We’ve got an array of different delicious burgers, sandwiches, entrees, appetizers, desserts, and more--there is truly something for everyone! Join us at our Mooresville sports bar to experience endless entertainment, fun with friends and family, and of course our delicious food. Check out our current specials! These offers are limited time only, so come visit us today to be sure you don't miss out! Take advantage of our large-screen, high-definition TVs to see your favorite teams in action. You can watch your favorite basketball, baseball, and football teams while you enjoy a cold beer and excellent food and service. Bring the family or enjoy the game alone! Great food, great service, and great people - that’s our motto when it comes to our reputation. If you are interested in being a part of a fast-paced, growing environment, Kickback Jack’s might be the career for you. We are now hiring local Mooresville Team Members for our new location. Learn more about hourly positions today! Our sports bar in Mooresville is your number one stop for daily drink specials, signature cocktails, and refreshing brews. 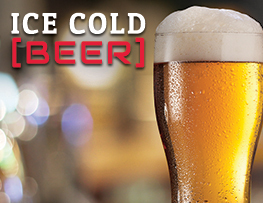 We offer drink specials every single day of the week, so no matter when you stop we'll have something for you! In addition to Mooresville, Kickback Jack’s provides great food, drinks and fun from sports bar locations in Durham, Fayetteville, Greensboro, Greenville, Asheboro, Raleigh, Hickory, Southern Pines, High Point, and Wilmington, NC, as well as Danville, Midlothian, and Richmond, VA.